Red Velvet Cake always fascinated me because of the stunning colour. But then, the origin of the colour did not fascinate me. Particularly when I red how much red colouring actually goes into "normal" red velvet cake. 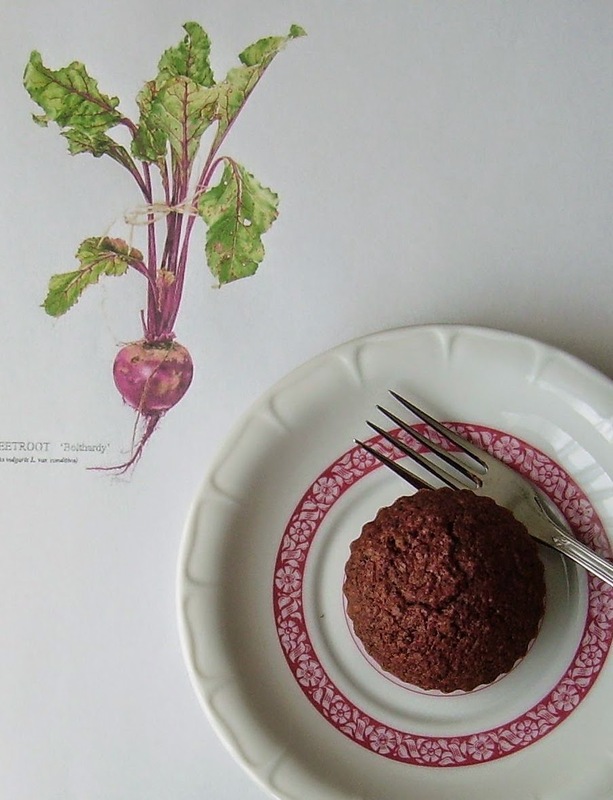 I played with the idea of beet juice for colouring long before I read recipes using beets for the colour. My first attempt was with cooked beets. To be honest, I have no clue how other people get their cake so incredibly red with beets. 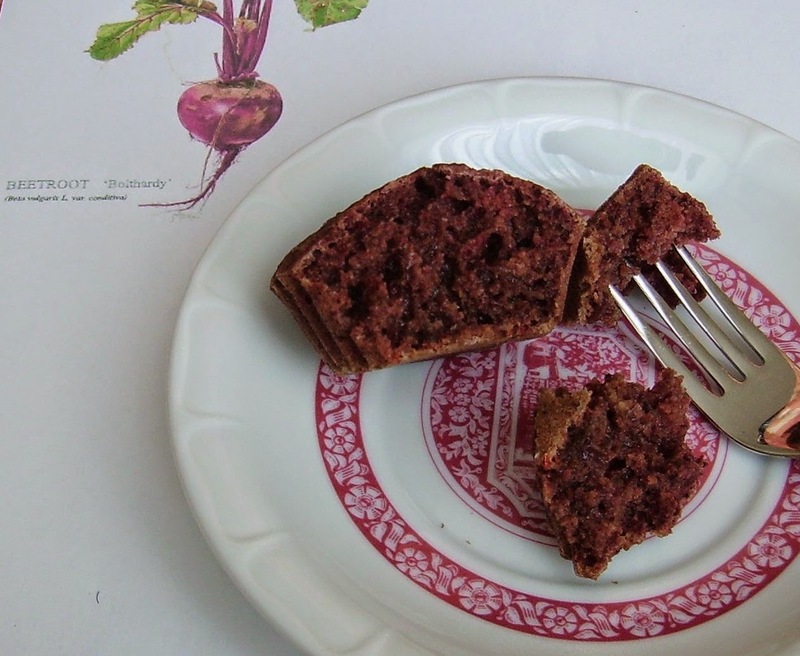 The one with cooked red beets had a distinct earthy beet taste, and the colour was an ugly reddish-brown. I tried to get a decent photo adding some chocolate frosting to the cupcake, but that, unfortunately, looked like a dog had left his big business on top of an ugly reddish-brown cupcake. Yuk. My next attempt featured one small raw red beet and a half cup blueberries. I used a lot of acid and raw organic cocoa powder, but still the cupcakes don't look exactly red. They are crunchy on the outside due to the erythritol I used, and very gooey on the inside. Gooey, sweet, a bit fruity and slightly chocolate-y. They don't look gorgeous, but they are gluten free, vegan, moist and yummy, and the colour, even though not as deep purple as my imagination would like, clearly has some purple in it. If you use other sweetener, the outside most probably won't be as crunchy. Erythritol doesn't give up its crystal structure, so I made the experience that cakes with erythritol may be wonderfully moist on the inside, but the outside gets crisp, and sometimes you even see white crystal structures on top of a cake. Personally, I don't mind. I don't want to eat tons of sugar, so I accept that baked goods using erythritol don't look like perfect pieces of art and that the texture might differ from what we are used to. It's an adventure, right? And as long as it tastes good and is healthier than your average piece of cake, it does neither have to be mainstream nor elegant. It's a healthy piece of art on its own. Preheat oven to 350°F / 180°C (325°F / 170°C for convection oven). Line cupcake tray with 12 paper cups. Puree peeled beet and mushy blueberries with 1/2 cup water and lime juice. Combine wet and dry ingredients, let sit for a minute, then pour batter into cupcake tins. Remove from tray and cool completely on a wire rack. Frost with your favourite frosting or enjoy plain. I like to just eat them plain or top them with some almond butter. 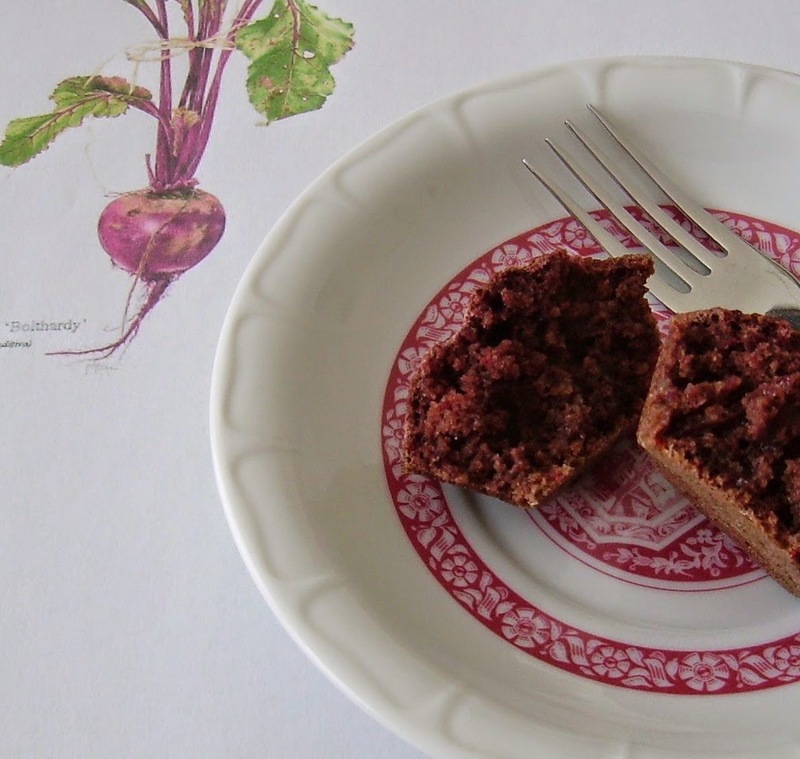 Have you ever tried to use beets for baking cake?